This extension was built at the request and under the supervision of one of the best SEO firms in the country and it is absolutely loaded with the SEO enhancing features you need to start bringing in more and more traffic! There is really so much packed into this directory extension and whatever your purposes are, the possibilities are endless! Create as many directories as you wish. You can have one for lawyers, for sneaker stores, for car dealerships, etc. Whatever and however many you want. Each directory will have it's own unique URL, chosen by you. 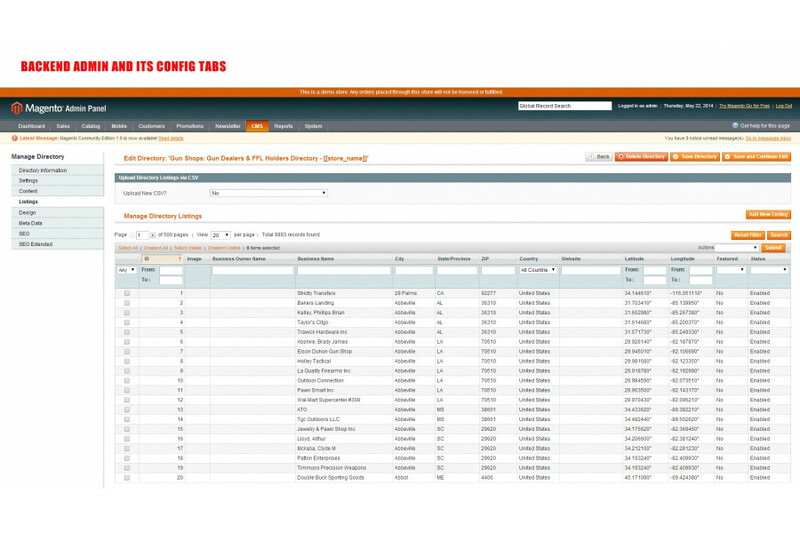 Each directory can have an infinite number of listings. Each directory can be enabled/disabled for specific stores. Each directory is individually configurable. You can have completely different config options for each directory. Each directory has it's own design options just as a CMS page does. For those that code their own websites, each directory has a general XML handle and a specific XML handle for local.xml so that if a specific listing needs to be configured differently, it's very easy to do so. Each directory can have up to 2,000,000 characters of text to display. 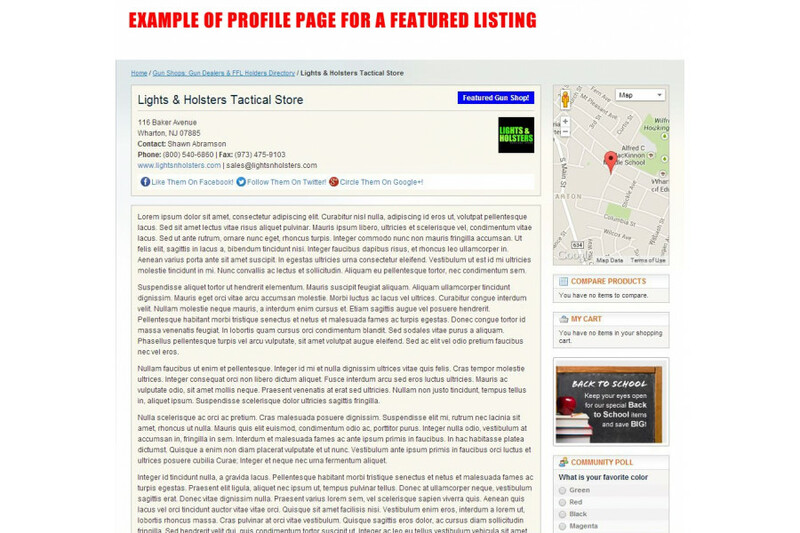 You can choose to display special or preferred listings in a "Featured Listing" in a block in either the right or left column. You can export your full directory to a CSV for backup / reimport purposes. 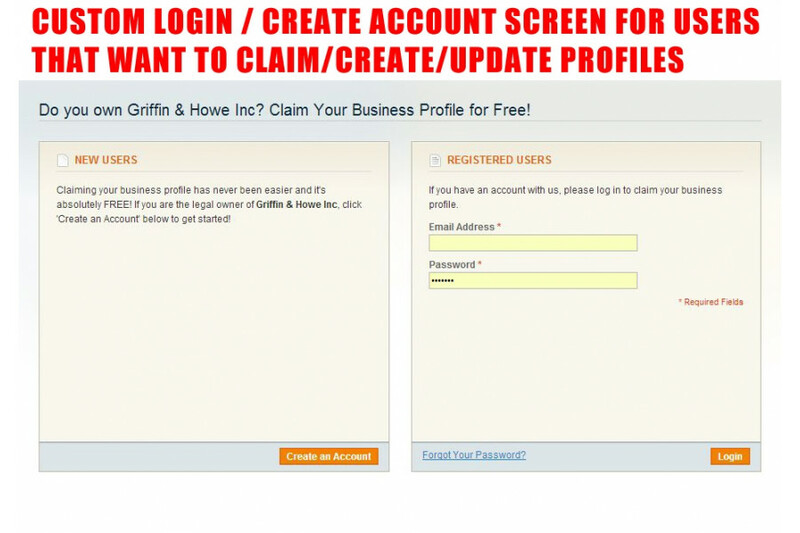 You can choose whether or not to allow users to "Claim This Profile". 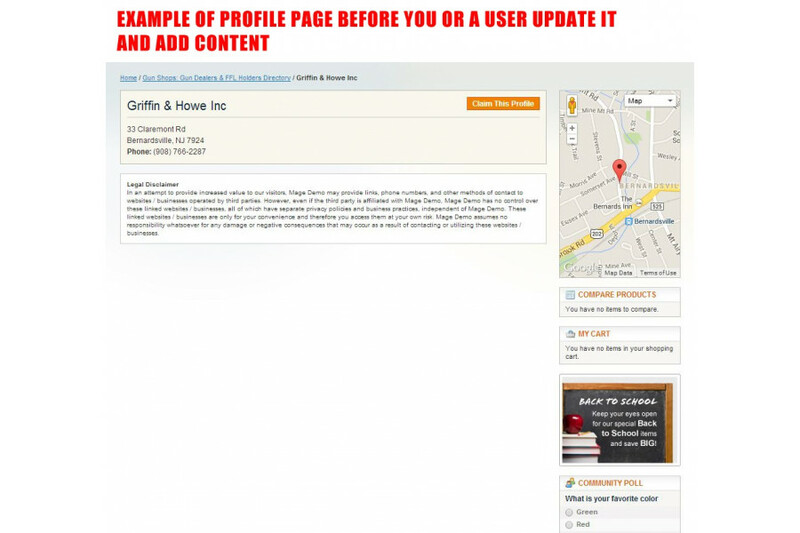 You can choose whether or not to allow users to create a new profile. 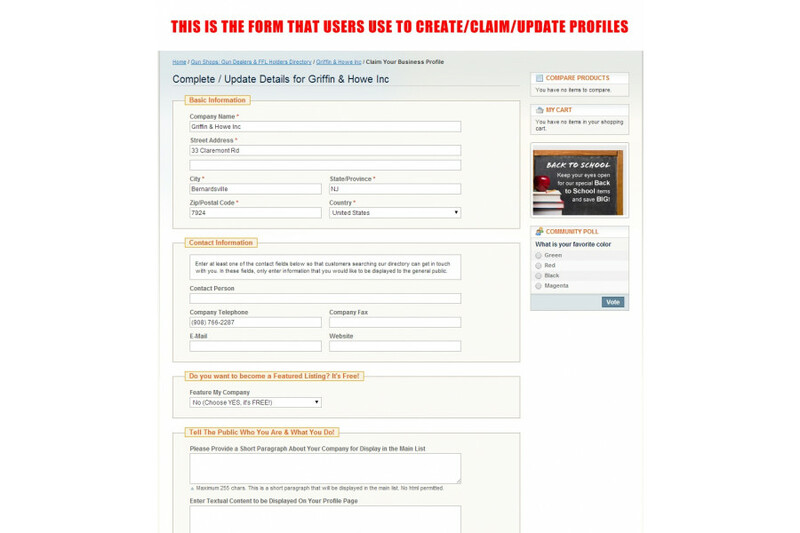 If you choose to allow users to "Create/Claim/Update" profiles, the new or updated listing data will go into a queue for you to review and approve before setting the new listing or changes live. For listings that a user claims or updates, you will be able to see and compare the changes they made before setting the changes live. 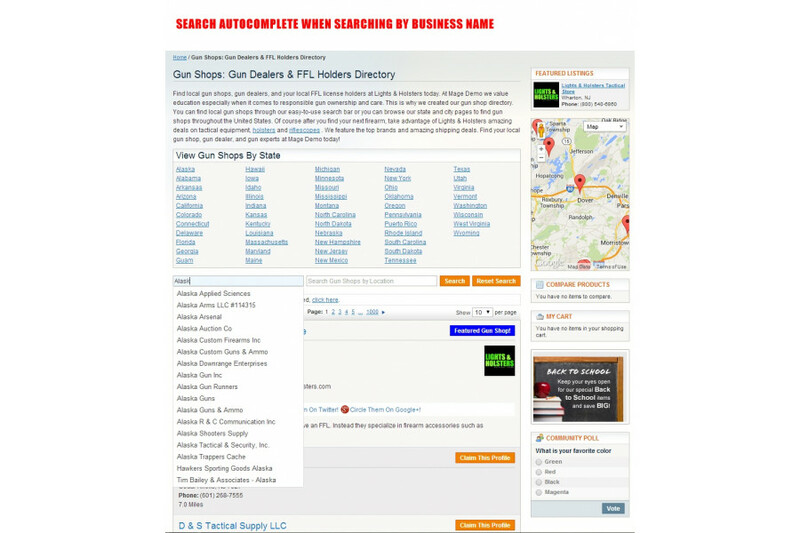 When searching using the "search by name" box, autocomplete is implemented showing a menu of matching listings. Listings will be displayed in a list in the same manner that products are. They can be clicked on to view a listing's individual profile page. 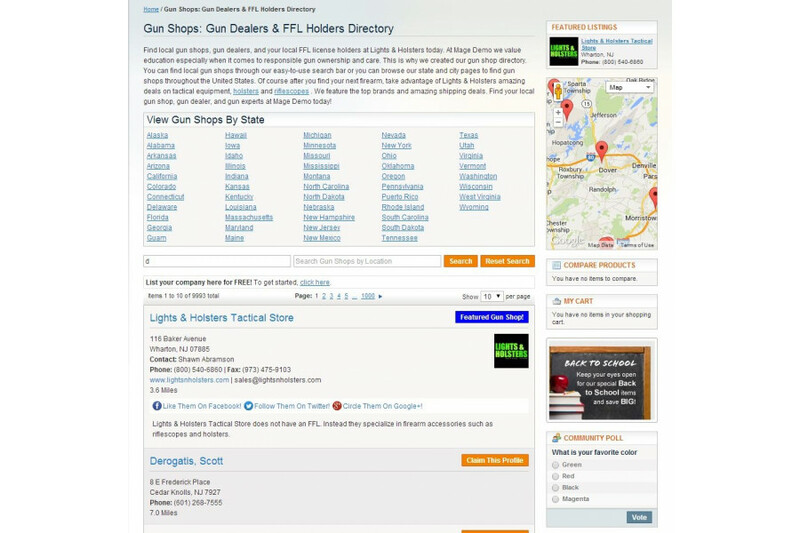 Listings can display a business' logo, contact info, social networking pages, and website url. In the list, you can display 255 characters of text about a listing. On the listing's profile page, you can display up to 2,000,000 characters of text. For those that code their own websites, each listing has a special xml handle for local.xml so that if a specific listing needs to be configured differently, it's very easy to do so. Built in Google Map showing pins for each listing currently on the page. Geospatial Search! On the directory is a location search box. When you enter terms and search by location, the extension communicates with Google and Bing Maps to get latitude and longitude for the location you are searching. You will then be presented with listings in distance order from the location you searched. You can type any terms just as you would on google, something as simple as Mount Rushmore or 90210 or 123 Main St Anytown, TX. Listings are shown in distance order from the user's location. The extension takes the user's IP address to get their general location and determine the order in which to show listings. You can geocode(that is, get the latitude and longitude) for each listing when importing a CSV with listings, manually creating a listing, or by checking boxes in the admin grid. The extension makes use of FREE versions of both Google Maps and Bing Maps geocoding services to obtain the latitude and longitude of your listings anywhere in the world. (requires you to obtain free API keys, links to get the keys are included). You can choose to display distances in either miles or kilometers. You can easily adjust the map size to suit your site's column width through the admin options. Business Directory Packed with SEO Features! You can allow users to filter by any or all of the following: Country, State, City, Zip. The directory was designed to make sure that you are not creating and using duplicate content. This is made possible through a special tagging system we created that can be seen in the examples below. Each filtered page can have dyanmic Title Tags in this format: Lawyers in [[listing_city]], [[listing_state]] & [[listing_city]] Lawyers. On page, this example would translate to: Lawyers in Detroit, Michigan & Detroit Lawyers - Yourstorenamehere. Each filtered page can have dynamic on-page text content in the same format shown above. 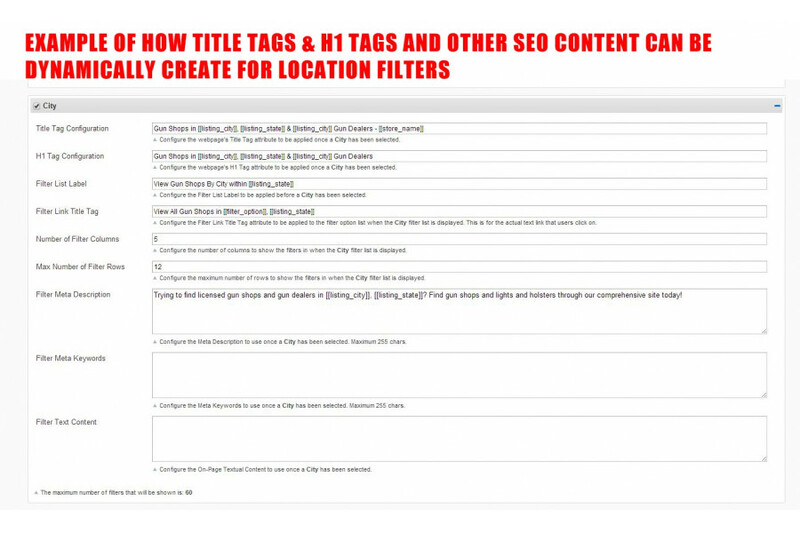 Each filtered page can have a dynamic meta description in the same format shown above. Each filtered page can have dynamic meta keywords in the same format shown above. 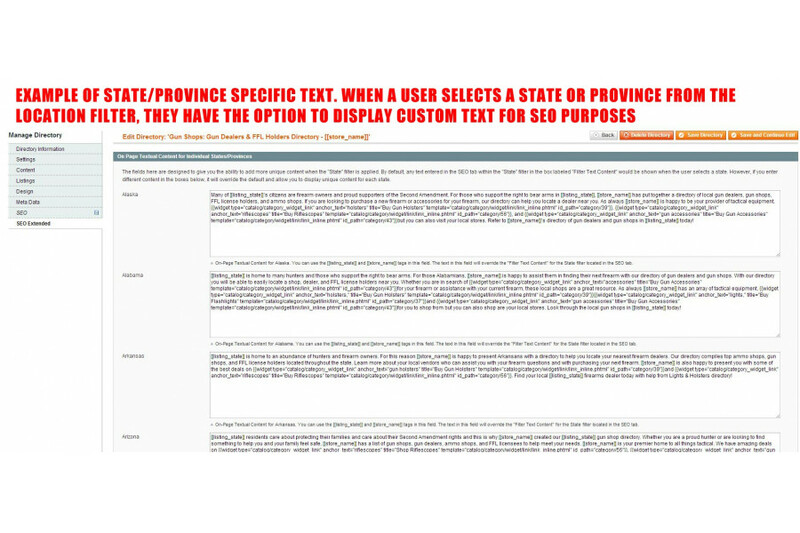 For pages filtered by State, you can either use a dynamic template as shown above or you can create your own fully unique text for each state in your directory. For the location filters, you can choose, for example, how many cities to present for your users to filter by. If a state has 500 cities, you may only want to display the names of 50 cities. Staying with the example of filtering listings by city, if you were to limit the number of city filters to show, the 50 cities appearing most in your directory would be shown in order to make sure you are showing the most useful city filters. Each listing profile page can have a dynamic meta description. Each listing profile page can have dynamic meta keywords. Upon importing a CSV or manually creating a listing, the business' name will be converted into a url. You can select an option to append the location info to the URL, which can be especially helpful if you are trying to rank for a certain location and it also helps you avoid creating duplicate URLs for businesses that have the same name. For example, if there was a business named "Your Store's Sneaker Shop", you could choose to have the URL automatically created as "your-stores-sneaker-shop"(without location info) or "your-stores-sneaker-shop-chicago-il"(with location info). Of course, you can also manually create the URLs but its much more efficient to let the extension do it for you. When URLs are automatically created for you, the 's (apostrophe "s") is handled properly for you. As in the example above, "Your Stores's Sneaker Shop" would become "your-stores-sneaker-shop". Notice how the apostrophe is treated. When you add links to a listing that lead to a business' website or social networking pages, yes, you will be taken to the appropriate destination. What users and search engines never know is this: any links that point to urls outside of the directory first have a rel="nofollow" set on them. However, the link points to another page on your website that has the robots set to NOINDEX, NOFOLLOW. From this noindex, nofollow page, you are then redirected to the intended URL destination. This all takes place behind the scenes and your users never know. Handling outbound links in this manner enables you to make sure that Google/Yahoo/Bing never see any outbound links from your site while still providing your users with a way to go to a specific business' website or social networking page. Anytime someone creates or claims a listing in your directory, they will be given the option to become a "Featured Listing" for free. However, there is a catch! 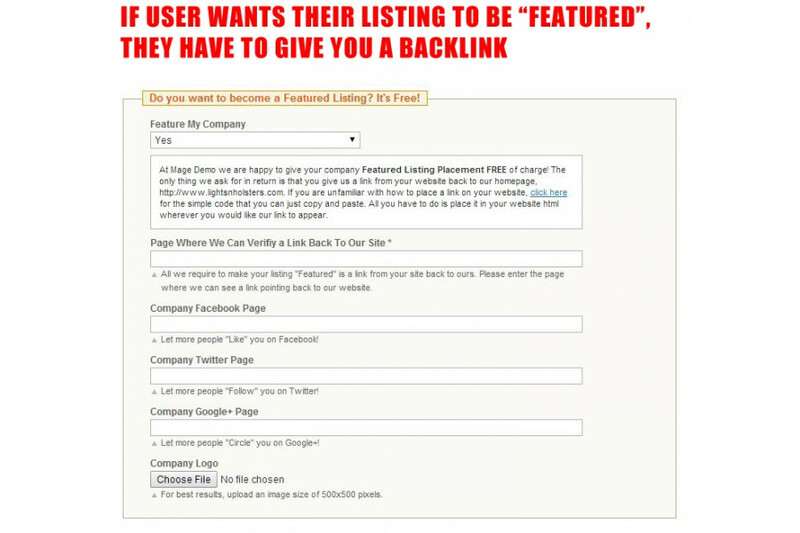 They cannot become "Featured", which means displaying their listing in the special box to the right, displaying their business logo, and displaying links to their social networking pages without providing you with a backlink. That's right, the price to become a "Featured Listing" is a mimimum of 1 backlink to your site from their site! Each page of the directory and the listing profile pages are equipped with Google Rich Snippets code. 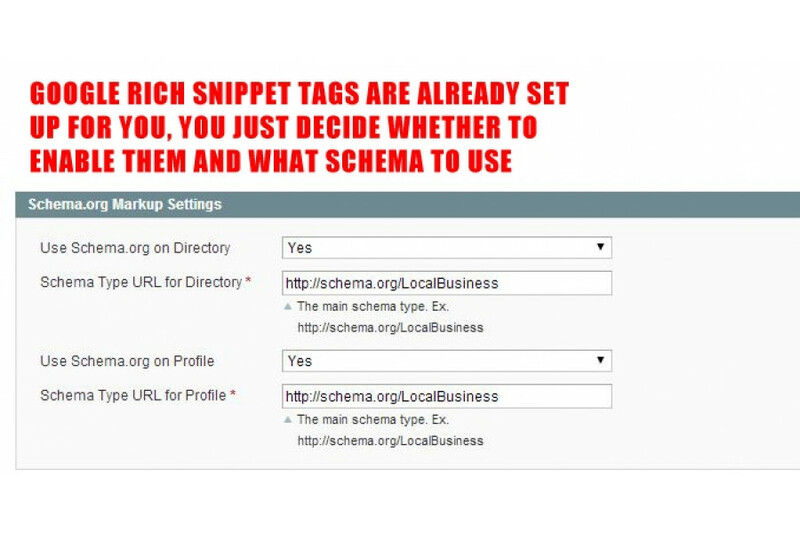 You can choose whether or not to enable Google Rich Snippets for the directory list itself and also for the listing profile pages. Automatically send customers confirmation e-mails when they add a new company / claim an existing company / update a company. Automtically send customers e-mails when you approve their listings and / or updates. If customer selects a "Standard Listing" instead of a "Featured Listing", they will receive an e-mail reminding them that they can upgrade to a "Featured Listing" for free. Can't beat this extension for free. It does everything other paid ones do!! Review by Great Extension Packed Full of features!